Create a beautiful backyard retreat with a vinyl liner pool! There are many standard shapes and sizes or Hawaiian Pools can custom design your pool with ledges, steps and benches. Vinyl liner pools are typically the more economical choice for backyard pools, while providing relaxation, fun and beauty at the same time! Vinyl liner pools are constructed of steel walls and a vermiculite bottom (a type of concrete). 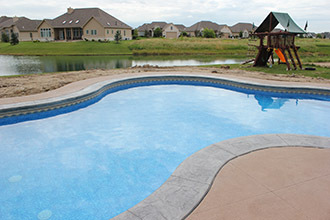 A liner is then inserted for a soft, comfortable pool surface that comes in many patterns and shades of color. Following a comprehensive consult with one of Hawaiian Pools’ designers, you will have determined a pool location which we will use to lay out the pool for the dig. A two foot “over dig” is incorporated to accommodate the double X steel bracing for extra reinforcement of the pool walls. The steel walls and bracing are galvanized. After the steel bracing is completely anchored with a base of concrete, a vermiculite (concrete) bottom is troweled in. Two main drains are set in the deep end of the pool floor and the skimmer and returns are plumbed. 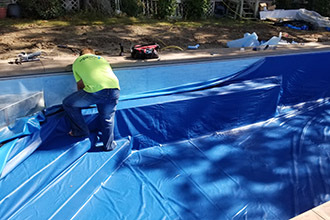 We take extra time to plumb all our pools with the best materials and piping with time proven techniques. The over dig is then filled in with compactible stone. 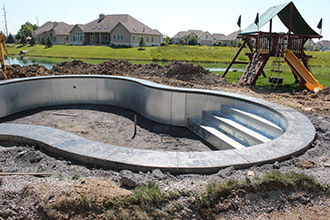 Next is the installation of the concrete coping which is a decorative Roman stamped pattern that will give your pool a custom and quality look. At this time, your pool equipment such as the heater, pump, and filter are being set and connected to the pool. Time for the liner! The liner is installed with vacuum suction onto the wall and cut into place where needed. Now, you are ready for the water. 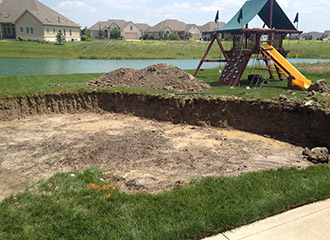 All that remains is for the concrete surround to be installed and you have your new backyard ready for family, friends and fun.